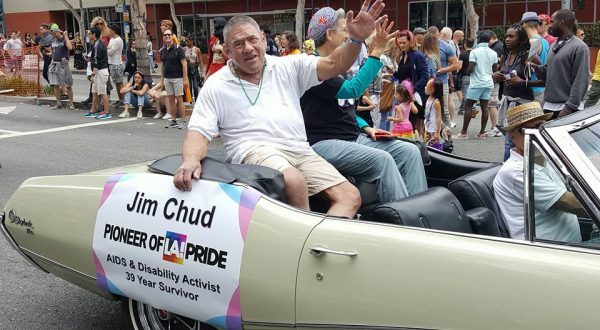 UPDATE: A celebration of Jim Chud’s Life will be held this coming Sunday from 5 to 7 p.m. in Rooms 1 and 2 at the Plummer Park Community Center in West Hollywood. Please RSVP to: fx714@earthlink.net. Read more about the extraordinary life of Jim Chud in the piece below previously published on March 11. His friends describe him as cantankerous and argumentative, and delightfully humorous and warmly social. He was a beefy and muscular gay man with a handicap that left him bent over and unable to move forward without a walker. He had been HIV positive for more than half his life, and at one point he was addicted to opioids. He is Jim Chud, and earlier this week he died. The cause of death has not been determined. Jim Chud, 62, a resident of the West Hollywood Community Housing Corp.’s Sierra Bonita building on Santa Monica Boulevard, was an expert in artificial intelligence and an architect and had a master’s degree in psychotherapy. He had served on the city’s Disabilities Advisory Board and on the L.A. County Commission on HIV. Chud also launched Advance Abilities Inc., a non-profit whose mission is to chronicle the stories of disabled seniors in the United States and also to provide tools to help them better experience life. He also is one of the country’s longest survivors of HIV – a disease Chud contracted more than 40 years ago. Chud became infected with HIV when he was a 20-year-old athlete at Yale University. In an interview with CNN, he said he then was leading a double life. He had a girlfriend, but also spent weekends at gay bathhouses in New York City. In an essay published in HIV Plus magazine, Chud, who in 1987 was living in Washington, D.C., said he “drove to the National Institutes of Health and volunteered for whatever clinical trial would take me. I was 29, and not expecting to see 35. If I somehow hit the jackpot and the drug in my study was an answer to AIDS, then fantastic. If not, and the drug was useless — which was the more likely result — then at least I had done something concrete, even if it was just helping eliminate one of the failing therapies. Chud was diagnosed in 1999 with a fungal infection of his sinus and brain that also required surgeries and many courses of toxic medication. It was a struggle that left him in Cedars-Sinai Medical Center for five months and, at one point, broke and homeless. Over time, he had more than 80 operations on his spine, neck and major joints, leaving him seven inches shorter than when he began that drug study in 1987. “The gift of being broke made me more empathetic and aware of the ways that we can help each other,” Chud said in an interview in 2017 with West Hollywood Community Housing Corp.
As noted in an interview with WEHOville, Chud has spent years researching obstacles that disabled people face to living life. Among those are the failure of websites such as Yelp to note whether a restaurant is accessible by disabled people and issues with “rollators,” the devices used by some to assist them in walking, that no manufacturer seems to be addressing. Chud cited his experience as a resident of the Sierra Bonita as part of the inspiration for creating AdvanceAbilities. “Over the last seven years, I have lived in a building purpose built with both the funding and mission to house and provide social support services for disabled seniors and helping us create a mutually supportive community,” he said. “Sadly, I have watched the senseless decline of many neighbors merely because they have not received the support promised us all when we moved in. Adding in a lack of family support and unfamiliarity with American customs serves to make the situation even more dire for some. My friend, James Chud, you are a true legend and hero! It was an honor to serve alongside you on the West Hollywood Disabilities Advisory Board. You made me think, laugh and rejoice in serving our community and I will be eternally grateful. It was an privilege and blessing to know and learn from you. R.I.P. Jim. Hey Jim, pleasure to serve with you on the DAB and thanks for your constant inspiration to do good for others with disabilities. God Bless. It’s sad to see someone go who has done so much for others. I wish I would have met him. Rest in Peace Jim. Bless you – warrior, pioneer, friend to many.